From all what I had researched, I had really high expectations from the countryside of Netherlands. 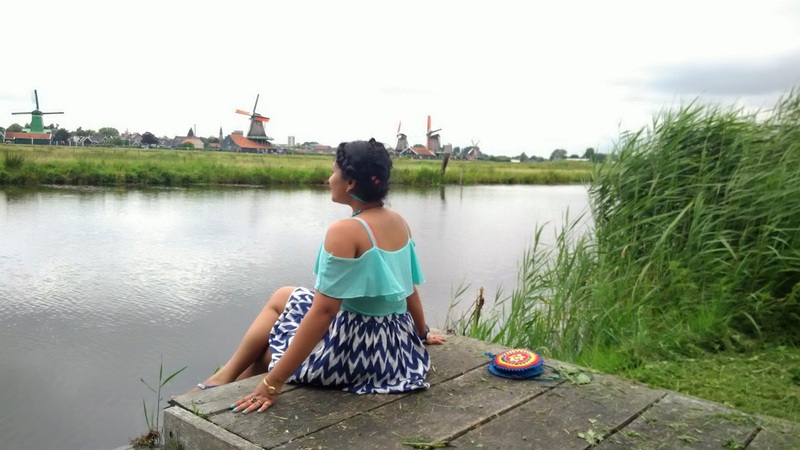 Since we were visiting in summers, there was no chance of tulips but the tall grass, the lakes, Dutch houses and the windmills had my heart racing. I was dying to visit them! We were really on a whirlwind trip in Holland. I mean we had just fourteen hours and we had to extract the maximum out of it. We followed the cardinal rule..the farthest should be covered first. So after the immigration checks, we bought the I am Sterdam card which was an all day bus pass for 13.5 euros each. However buying that card took two hours. I mean even after all the research we had done beforehand as to which pass would be the best for us, we simply did not know what to do when we landed there! Just outside the Schiphol Airport...fnally got to breathe Dutch air! There were many reasons. Firstly we needed a pass that had access to the countryside and not only in Amsterdam city. Secondly we had intended to use the train to go to Zaanse Schans, the nearest district in the countryside. The train pass was of 15 euros. Unfortunately on that very day, trains were not operating from the airport. Now we never thought this way and did not have a Plan B!! Moreover the kisoks at the airport accepted credit cards only and hubs was sceptical in using his card at the very first go. We had a long vacation in Italy ahead. With so much confusion, we lost two precious hours. Also the girls at the kiosks knew about Amsterdam only and no one could guide us about Zaanse Schans. Finally we bought the bus pass for 24 hours outside the city and stomped out of the Schiphol airport. The Airport Express bus took us to the centre of the Amsterdam city. From there we were supposed to take another bus to the Zaandam district. Our Airport Express bus dropped us at the Leidseplein stop from where we walked to the Amsterdam Centraal station. In between we got a glimpse of the canals and the wide IJ river. After that were a lot of escalators up and down, some running and hopping in my heels and gusts of chilly wind to reach the bus stop. There we waited for the 891 bus to take us to the countryside. Our bus to Zaanse Schans...the IJ river in the backdrop. It was too foggy and misty for clear pictures! The chilly wind at Zaanse Schans! Once we reached, I was overjoyed by the greenery of the Zaandam district. It was a 10 minute walk from the bus stop to our destination. Zaanse Schans is an open air museum that has eight working windmills at one place with a lake and beautiful Dutch neighborhood all around. We selected this place to get a feel of the countryside as this was where we could see so many windmills at a single place. We took the trail and started walking on the grass. The grasses were tall and itchy and the surface wet. After we made almost to the end, we realised that we had gone quite far from the windmill area. We again walked all the way back. Picnic by the lakeside..Recharging ourselves by gobbling some knick knacks. All the running and walking had made us hungry. We sat by the lakeside and gobbled whatever knick knacks were there in our bag. Energised, we walked to the windmill area. I was overjoyed by the sight of typical Dutch houses and of course the windmills. Always looking great you both love your skirt doll.